Join A Wider Bridge in Los Angeles on October 18 at a private house party to meet our newest grantee, Captain Ofer Erez, CEO of the Jerusalem Open House for Pride and Tolerance. Watch our short video to learn more about the program! Next month we are bringing a remarkable young Israeli leader to meet our community. At just 25, Ofer Erez already made history as Israel’s first openly transgender IDF officer. During his 3 1/2 years of service, Ofer spearheaded the fight for policy changes for fellow trans service members. At a time when some of our own decision makers are calling trans military service into question, Ofer provides a much needed voice for our LGBTQ advocacy here at home. In the Spring, Ofer traded out his IDF uniform for civilian clothing, continuing his leadership as the new CEO of the Jerusalem Open House (JOH), the capital city’s LGBTQ community organization and organizer of the Jerusalem March for Pride and Tolerance. 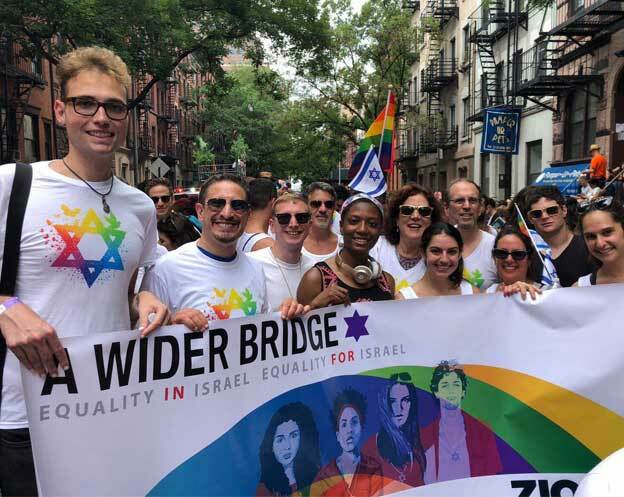 This summer, A Wider Bridge awarded Ofer and the Jerusalem Open House with an AWB Impact Grant to fund the Jerusalem March for Pride and Tolerance – attended in August by a record-breaking 30,000 people.